The First International Conference on Structural Mechanics in Reactor Technology occurred September 20-24, 1971 in Berlin Germany. This introduced the very first international conference, focusing on the structural mechanics within reactors. On a biennial basis engineers of multiple fields would reconvene to conduct similar conferences with the sole focus of improving the safety and practicality of nuclear reactors throughout the world. There are twelve divisions of topics that this conference has been divided into, each of which were divided into further subdivisions that are clearly labeled based upon their subject matter. May the material within this conference provide a lasting positive effect for centuries on end. It is a very great pleasure for me to welcome you on behalf of the Conference Committee, to this First International Conference on STRUCTURAL MECHANICS IN REACTOR TECHNOLOGY. I am glad that we can have this multinational Conference in Berlin. There has been some concern about whether I should deliver my opening address in German or in English. I have received the advice to address the majority of participants directly, and the majority of participants of this multinational meeting turned out to be of English tongue. Now, let me introduce to you the basic philosophy of the Conference. The problems of nuclear power plant development have made it mandatory to expend a considerable effort in research and development in the field of structural mechanics, and there is now an increasing recognition of the vital importance of structural mechanics for the growth of reactor technology. With the striving for ever higher economy, reliability, and safety of nuclear power, as well the number and depth of problems as the scientific manpower to solve them are continuously increasing. As a result, in recent years the field of structural mechanics in its application to reactor technology has been growing in stature and influence in an ever steeper gradient. The First International Conference on STRUCTURAL MECHANICS IN REACTOR TECHNOLOGY will show–and by its assembled preprints has already done so-a considerable bundle of recent achievements in the analysis of stress, deformation, stability and limit load for diverse kinds of nuclear reactor components, associated equipment and reactor building structures. The areas of applications of structural analysis range from such tiny “structures” as coated fuel particles, over fuel elements, solid moderators, reactor core support structures, reactor pressure vessels and piping; to reactor containment structures. The underlying theories encompass the whole spectrum of structural mechanics. The Conference will make visible in concentrated form the great challenge and stimulus which reactor technology means for the structural analyst and the research worker in the field of engineering mechanics. While pure science mostly will find an application to engineering, in reverse, also the rapidly advancing new technologies can provide a stimulus and a challenge to pure science. Solution of the problems of mechanical and structural design and analysis arising in reactor technology is, of course, in the first line serving the immediate special needs of reactor technology itself, but at the same time, in my view, it also provides one of present day’s most important influxes of enrichment and inspiration to the general field of structural mechanics. The assembling of diverse specialized applied papers together with relevant survey papers on fundamental theoretical developments does show a lively interaction of science and technology. But let’s cease now to talk about the abstract world of papers let me talk about the people to which this conference offers a place and a time to meet and to communicate. This truly international meeting has brought together-for the first time to an appreciable extent-those mechanical and structural engineers who are actively engaged in structural analysis and specialized engineering mechanics research work in the field of reactor technology. Reactor technology is a field in which the sharp boundaries that once set apart the mechanical engineering from the civil engineering discipline are breaking down. Beyond assembling mechanical engineering and structural engineering specialists engaged in reactor technology, this meeting has another important aim, namely to bring the presently most acute practical problem areas to the attention of scientists in the general field of engineering mechanics. These scientists, devoted to fundamental research, may feel the appeal of the conference topic and are competent to contribute to the solution of these problems, but up to now may not be sufficiently aware of the many technologically important and scientifically fruitful existing problems. Communication is a two-way process of transmitting and receiving ideas, problems and concepts. The First International Conference on STRUCTURAL MECHANICS IN REACTOR TECHNOLOGY will enable communications in different directions. In fact, the Conference has deliberately been designed for a type of multi-dimensional communication. First of all, the specialist can communicate with experts in his own field. This is the usual linear dimension of topical meetings. The second dimension of this meeting extends across the boundaries of the technical fields and should initiate a cross-fertilizing of the different technological disciplines involved. Just for an example, the civil engineer involved in the structural analysis of prestressed concrete reactor pressure vessels may find profit from the mechanical engineers’ computational developments for the inelastic analysis of graphite moderator blocks, and eventually he may even be inspired by the materials scientists’ computational developments for the microstructural analysis of reactor fuel materials. The third dimension of the Conference results from its bringing together mechanical and structural engineers with fundamental research workers in the general field of engineering mechanics. Due to the truly international character of this meeting there is also a fourth dimension of communication across the boundaries of countries. As far as I personally am concerned, it is just this multi-dimensional intellectual environment, open to all directions, which has attracted myself to the field of nuclear technology and which is fascinating me through all the years since I jumped in . The Conference Committee is grateful to everyone who has given thoughts, time and influence towards the materialization of the conference idea. We are grateful to the institutions and societies who are giving their co-operation, particularly to the General Directorate for Dissemination of Information of the Commission of the European Communities which has made an enormous contribution in efforts and means. My gratitude to the Director General, Mr. Breé, is beyond what I can express in words. I owe to him that the Conference in its present style has become feasible. On behalf of the Conference Committee I further express our gratitude to the Senate of Berlin for its generous general support of the Conference. Personally I want to say thank you to my friends and colleagues who have encouraged me to pursue the idea of this Conference and have supported me continuously from the very beginning of the planning of this endeavour. I am grateful to the President of the Bundesanstalt für Materialprüfung, Professor M. Pfender, who has allowed me to devote part of my time to organizing the Conference, besides of my regular duties, and allowed for secretarial help and some printing support to get things started. I should specially mention in deep appreciation that the organization of the Conference is very essentially owed to the organizational talents and devoted work of two ladies, Mme. J. Stalpaert of the Commission of the European Communities and Mrs. E. Kleversaat of the Bundesanstalt für Materialprüfung. Beyond all this, the Conference Committee expresses its gratitude towards the authors who have submitted well-written meaningful papers which are the very means which have attracted you to the Conference. Their willingness to openly describe their achievements, share experiences and confront their concepts is greatly appreciated. The concept of the Conference is that of a meeting prepared for extensive discussions, facilitated by advance distribution of preprints to the Conference participants. It should be pointed out that 70 percent of the original contributed papers were received in time to go into the preprints, whereas a good international average is said to be only 60 per cent. A really Prussian type of discipline, I would say. The papers which are available in the preprints should be presented only in their essentials with the main time being left for detailed discussions. Those papers which are not available in the preprints necessarily have to be presented in a bit more detail. We have an opportunity during this week to use the international meeting to promote further cooperation in the forementioned multidimensional sense. We must cooperate more so that we can advance together more surely and more swiftly than we can alone. May this Conference now run in the spirit of open communication among all participants and yield scientific profit to all of you, so that in this way the meeting will contribute to promoting the progress in the peaceful exploitation of nuclear energy. May it in this way contribute to further the prosperity and welfare of people everywhere. We are confident that your active participation in the Conference and its social events will enable you to take home one of the most precious commodities a meeting like this can offer, namely human contacts. 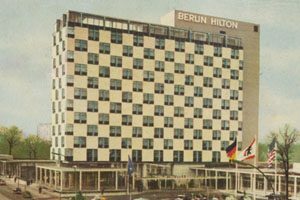 For your convenience in meeting old friends and making new ones, and for your enjoyment, we have arranged on Tuesday an evening in Old Berlin in the Hilton. I would be glad if you would participate in this event. Today evening there will be a reception of the Regierender Bürgermeister in the Schlolß Charlottenburg. In the name of the Conference Committee I herewith open the Conference. We wish you having an interesting meeting and enjoyable days in Berlin! The conference committee list is a scan of the original document converted to a PDF format. You may access it directly via https://www.iasmirt.org/doc/1-conference-committee.pdf. This webpage will redirect to the conference committee document in approximately 15 seconds. When you are finished please use your “Back” button to return to the IASMiRT website. The authors list is a scan of the original document converted to a PDF format. You may access it directly via https://www.iasmirt.org/doc/1-authors.pdf. This webpage will redirect to the authors list in approximately 15 seconds. When you are finished please use your “Back” button to return to the IASMiRT website. The conference committee list is a scan of the original document converted to a PDF format. You may access it directly via https://www.iasmirt.org/doc/1-conference-committee.pdf This webpage will redirect to the conference committee document in approximately 15 seconds. When you are finished please use your “Back” button to return to the IASMiRT website. The participants list is a scan of the original document converted to a PDF format. You may access it directly via https://www.iasmirt.org/doc/1-participants.pdf. This webpage will redirect to the participants list in approximately 15 seconds. When you are finished please use your “Back” button to return to the IASMiRT website. The closing remarks text is a scan of the original document converted to a PDF format. You may access it directly via https://www.iasmirt.org/doc/1-closing.pdf. This webpage will redirect to the closing remarks document in approximately 15 seconds. When you are finished please use your “Back” button to return to the IASMiRT website.